In this tutorial I will explain how to drive WS2812B with STM32 using TIM PWM and DMA peripherals in the most efficient way by using minimum amount of RAM, required to process all leds. There is a good explanation, already available on the web. If you have no experience with WS2812B leds, I strongly recommend you to read the blog post. It is very well written, but it has one major issue. It uses 24 words of RAM for each LED, which is 96 bytes per LED. If you have 100 leds, that’s almost 10k of RAM. STM32 hardware allows you good way to scale down this ram usage to 3 bytes per LED, which is 300 bytes at 100 leds = 32x more efficient! In addition to this memory, we also need temporary buffer to store 2 LED raw PWM data, used for DMA hardware. All together we need 3 * LEDS_Count + 24 * sizeof(uint32) bytes. DMA hardware in all STM32 families allows you double buffering mode. In this mode, you have 2 memory addresses and DMA will switch between memories at the end of block transaction. Handling this may add some additional code in our project. Second option we have is to use single buffer mode and rely on DMA Transfer-Complete and Half-Transfer Complete events. They are called at the end of block transfer and in the middle of block transfer, respectively. receive Transfer Complete event (TC event) after all elements were transferred. Since we are receiving 2 events in the middle/end of block, we can use single buffer DMA mode but interact with it as double buffer data. DMA in STM32 also supports circular mode, which basically means that once we are at the end of block transfer, DMA will start from the beginning of memory and will transfer more data (this is visible on picture below with left arrow). We will use this feature for our raw data for PWM for each LED. Each LED has RGB format for color, which represents 24 bits of data (or 3 bytes). To have information for all leds, we need 3 * leds_count big array with R0,G0,B0,R1,G1,B1,R2,G2,B2,… color structure. There is no dead-time between end of first led and beginning of second led! Implementation is done using single timer + PWM output on one of its channels. DMA is used to transfer data from memory to peripheral compare register for PWM output. Single 48 words long array is used for data transfer, acting as double-buffer DMA. On the beginning, memory is configured with all zeros for reset pulse. This is transfered with DMA to PWM channel and we have to wait for TC event. Once we have the TC event, we can start preparing a data for first LED. To send 24bits we need 24words only and according to bit values, we set duty-cycle to either 33% or 67%. When we are configuring the first LED, we also need to prepare the same for second LED and fill second part of main buffer. Next step is to start the DMA transfer in circular mode and wait for HT event. 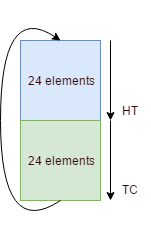 When we receive HT event (half transfer of 48 elements transfered), we know that first LED was completely transferred to PWM and we no longer need this memory for it, thus we can start prepare memory for third LED. Later, we will receive TC event, which means that second LED was successfully transferred to PWM and we no longer need second part of memory for second LED. At this point, data for third led started to transfer from memory to PWM and we can use second part of our 2-LED array to configure forth LED data. When we transfer all leds, we can simply stop the DMA transfer and configure reset pulse again to send 40 elements of all zeros for 50us low pulse. Pattern is that ODD LEDs are in top part of big memory (on image above is blue part), while EVEN LEDs are on bottom part of big memory (green part). This is very well visible, but now we have to finish transfers somehow. I will show example for 2 or 3 leds. These 2 examples clearly show that we have to manually take care of when to manually stop DMA, either on TC or HT events. MCU uses internal HSI clock, increased via PLL to 84 MHz. Example is coded in Keil uvision and is below 32kB which means you may use it as free of charge. Download code from Github account.